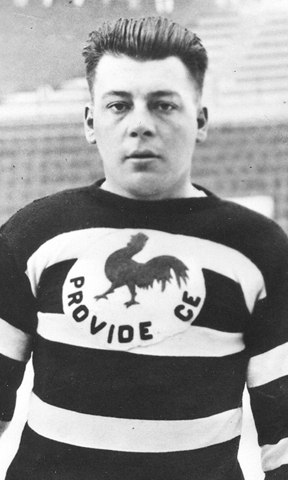 A “Class of 1963” charter inductee, Harold “Gizzy” Hart, also known as “Wilf”, was a member of all three Providence Fontaine Cup championship teams. During Hart’s six seasons with the Reds, beginning in 1928 through 1934, he tallied 164 points, with 103 goals and 159 PIM in 240 games. From 1924 to 1925, Hart was a member of the Victoria Cougars, which won the Stanley Cup that same year. Traded to the bleu blanc et rouge of Montreal in 1926, this left-winger played three years in the NHL between the years of 1926 and 1933, garnering 14 points and 6 goals in a total of 104 games. He hung up the blades after his 1933-34 season with the Reds to try his hand at coaching.